SEASON 7: MEXICO CITY LIVE! For six seasons, the critically acclaimed series Mexico – One Plate at a Time has brought to life the foods, the flavors, the stories and the fun of Mexico for public television viewers. 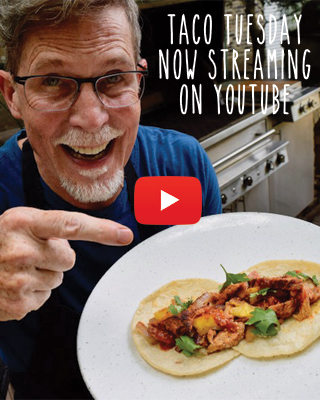 In each episode, beloved chef, restaurateur, author, teacher and culinary adventurer, Rick Bayless, effortlessly tosses together cooking demonstrations, cultural musings, exotic locations, ideas for home entertaining and a generous helping of off-the-wall surprises to create a whole new kind of cooking show that mirrors the thrilling diversity and depth of Mexico. Now, Frontera Media Productions proudly announces Season 7— Mexico City Live! These days, it seems there’s not a travel, food or lifestyle magazine that hasn’t done a story on Mexico City, and for good reason. The world’s most eye-opening food metropolis has it all: traditional foods and flavors from all over the country, as well as some of the coolest cutting-edge eateries anywhere. So this season, Rick takes a fresh look at 13 iconic Mexican dishes, from tacos and enchiladas to chiles rellenos and carnitas — on a deep dive into Mexico City’s mouthwatering market stalls, hidden-treasure taco stands and restaurants, where chefs are turning out high-style takes on dishes in ultra-cool dining rooms that range from rustic-elegant to urban ultra-hip. As always, back in his own home kitchen, he shows viewers how to recreate the spirit of those classic dishes in everything from easy, casual dinners to full-blown parties. There’s a magical Mojo de Ajo sauce that’s culinary gold on everything from popcorn to pasta; a luxury guacamole bar that offers a whole new do-it-yourself way to entertain; an authentic, made-ahead Chicken in Mole for a crowd, and much more. Rick also takes us behind the scenes at his world-renowned restaurants, Frontera Grill and Topolobampo, to see how he and his chefs reinvent classic Mexican dishes in fresh new ways, like his signature sous-vide Carnitas and a dazzlingly decadent Pan-Seared Lobster with Truffles and Pata Negra Ham. Mexican cooking has come into its own as a vibrant new source of creativity. And Mexico City is where it all comes alive. Join Rick for his greatest food adventure yet: an insider’s tour of the capital of cool — and the soul of a new cuisine. Mexico One Plate at a Time, Season 7—Mexico City Live! Episode 1: Tacos on Fire! “What is a taco, anyway?” muses Rick over an upscale lobster taco at his white tablecloth restaurant, Topolobampo. “Is it crispy or soft? Grilled or griddled? Street food or taquería fare? Fast food or fine dining?” The answer is, “all of the above … and a whole lot more.” And to prove it, Rick heads to Mexico City, for a non-stop taco trek. It starts at Fishmart, a neighborhood seafood restaurant in trendy Condesa with the lobster tacos that inspired Rick’s Topolobampo version – succulent chunks of grilled lobster and black beans, wrapped in a warm corn tortilla. Following his nose, and the smell of smoldering charcoal and sizzling meat, Rick moves on to explore some taquerías – one renowned for its char-grilled tacos al carbon and another for pork tacos al pastor, made on a revolving vertical grill, gyros-style. Here too, it’s all about simplicity: a few perfect mouthfuls of mind-blowing meat and super fresh tortilla. But Rick’s saved his favorite underground street-food discovery for last. Super Tacos Chupacabras is hidden away under a freeway overpass. But it’s so over-the-top, and the griddled tacos and slow-cooked toppings are so tasty and cheap, everyone from VIPs to bike messengers line up all day and all night. Back at home, Rick gets ready to throw his own “Supertacos” party with a little help from his friends. It’s a laugh-filled, spontaneous celebration of cooking and fun, as everyone pitches in to makeTangy Tamarind Cooler and Mexican Snakebite, Tacos of Seared Scallops with Chorizo and Potatoes and Rick’s easy version of Grilled Pork Tacos al Pastor, made right on the backyard grill. At the romantic San Angel Inn, a lush hacienda-turned-restaurant in Mexico City’s Coyoacán District, Rick enjoys what might just be the most passion-infused food in the Mexican canon: a quintessential plate of perfect chiles rellenos. From there, we visit La Merced – the sprawling, spectacular central market that’s the culinary soul of a city with 20 million mouths to feed – where chiles are bought and sold by the thousands. Americans are passionate about chiles rellenos, too. Just ask Rick’s customers at Frontera Grill, where only a lucky few who line up on the street get to enjoy them each night before the supply runs out. In the Frontera kitchen, Rick offers a detailed lesson on how they’re made – a labor of love that involves many carefully choreographed steps of roasting, filling and sauce prep, stuffing, battering and frying. Then it’s time for a crash course in chiles at the National University of Mexico in a visit with Ricardo Muñoz-Zurita, a renowned chef and food anthropologist who literally wrote the book on chiles relleno – a popular cookbook devoted to the subject – and runs a cutting-edge restaurant right on campus. The two friends share Ricardo’s latest twist on chiles rellenos: an ancho stuffed with plantains. Back at home, Rick explains that chiles rellenos don’t have to mean hours of prep time. And to prove it, he shares his recipe for Shrimp Chile Rellenos Grilled in Corn Husks. Next, we’re off to ’re passionate about chiles rellenos, this relleno roller coaster ride will leave you feeling thrilled, surprised – and stuffed. Everyone loves guacamole. And for every person you ask, there’s a secret recipe and a preferred style. In the kitchen of his Frontera Grill, Rick prepares the restaurant’s classic Mexican version, an institution since the day the place opened. But is it a classic? To answer that question, Rick goes to Mexico City, where he explains that guacamole just means “avocado sauce,” and shows us a series of equally time-honored interpretations of the term. There’s a smooth and creamy taco condiment at a busy taquería and, at the other end of the sauce spectrum, a chunky guacamole made in, of all things, a meat grinder, at a market stall that sells its perfect complement: succulent, crispy pork carnitas. And speaking of texture, Rick takes us to a cool, rustic-chic restaurant near Coyoacán square for a traditional Oaxacan guacamole that gets a bit of extra protein and crunch from a surprising garnish: chile-lime toasted grasshoppers. Back in Chicago, he gives us a quick introduction to avocado types and tips at his local Mexican grocery, and then heads home with a bagful and a very cool party: a Luxury Guacamole Bar with all kinds of toppings and nibbles to make a light meal. The centerpiece is his Roasted Garlic Guacamole, and he rounds out the spread with a refreshing Crab Salpicón, a Salpicón of Roasted Poblanos and Smoked Salmon, a tangy Orange-Tomatillo Salsa that balances the richness of the guacamole, and an array of crunchy toppings from crispy bacon bits to toasted pumpkin seeds. It all comes together at an outdoor party that raises the “bar” on guacamole in a whole new way. In their Chicago backyard, Rick and his daughter, Lanie, gather the last of the season’s tomatoes to make a big batch of Salsa Mexicana, the fresh tomato salsa sometimes known as Pico de Gallo. And that’s the starting point for a fast-paced salsa dance that goes way beyond tomatoes. In Mexico, salsas can be bright and fresh, dark and earthy, red or green, raw or roasted – and they’re more of a condiment for food than a dip for chips. At Los Parados, a favorite Mexico City taquería, Rick and Lanie show us the three pillars of Mexican salsa: that familiar fresh-tomato salsa Mexicana, salsa de molcajete made from roasted tomato, chile and garlic pounded in a lava-stone mortar, and red chile salsa, made by toasting, soaking and grinding dried chile de árbol. But that’s just the beginning. At Manolo, another popular taquería, they discover a rich, spicy, peanut salsa and a classic, creamy avocado-tomatillo salsa. And while they’ve got avocados in mind, they head over to the Medellin Market, where chunky guacamole is served with slow-cooked pork carnitas. Inspired by all this, they decide to make a “salsa all-stars” dinner. It starts with a batch ofRoasted Tomato Salsa, which they split in half. Rick turns his half into a Salsa with Olives and Dried Fruit to be served over grilled fish, while Lanie uses her half to flavor a Bayless family favorite, a Mexican-accented Mac and Cheese. Then they make an earthy Smoky Chipotle Salsa, which they again divide into two batches. One becomes the appetizer course, to be served with chips. The other half, Rick turns into a Manolo-style Chipotle Peanut Salsa to drizzle over grilled vegetables. It all comes together at an alfresco family dinner that proves a very Mexican point: beyond chipping and dipping … salsas can really cook! Nothing captures the spirit of a day at the beach in Mexico like the fresh seafood cocktail or ceviche. But you don’t have to be on the coast to enjoy it. Rick finds a classic version at a favorite spot with the feel of a beachside fish shack – right in the heart of landlocked Mexico City. Then, in search of more “inland ceviche” surprises, he hits the streets and takes us to a major-league marisqueria with a menu to rival any great seafood restaurant in town – all created in a stand no larger than a fishing boat. Rick enjoys the bracing blend of octopus, fish, shrimp and hot sauce known as Vuelve a la Vida (“Come Back to Life,” so named because it’s a popular a hangover cure). At a nearby fish market, he checks out the catch of the day from both the Pacific and Gulf coasts, and shares tips on the best choices for homemade ceviche. In Chicago, he makes a quick Frontera Ceviche, a preparation that’s been a mainstay at his Frontera Grill for years. Then we’re off to Fishmart, a casual Mexico City seafood place, for a taste of what just might be the next hot trend in cold seafood:aguachile. It’s a classic way to serve fresh shrimp and scallops with modern minimalist appeal – simply laying them on a plate and sprinkling them with lime juice, salt and fresh jalapeños. In his home kitchen, Rick recreates his version of Shrimp en Aguachile in a matter of minutes. Then it’s on to the one of Mexico City’s splashiest seafood hotspots, Contramar, to see how they dress up their traditional Ceviche Especial in a strikingly modern presentation. And that inspires Rick to take us behind the scenes at his fine-dining restaurant, Topolobampo, for one last inland ceviche recipe: his inventive, surprisingly easyHerb Green Ceviche. It’s a mouthwatering fishing expedition that brings home the pleasures of ceviche – even when you’re nowhere near the shore. Mole is an idea that’s half pre-Columbian, half European, and 100% Mexican – a sauce, a preparation and a national dish that rivals the culinary masterpieces of the world’s greatest cuisines. Rick and his daughter, Lanie, set off on a culinary journey to explore the mysteries of mole that takes them from the mile-high piles of dried chiles in Mexico City’s vast La Merced market to stalls selling towering mounds of concentrated mole paste. Back in Chicago, they’re on a mission to make mole from scratch. It’s an all-day labor of love to be sure, but Rick breaks the complex process down into easy steps, giving tips on all the ingredients – from sesame seeds and tomatillos to chiles and chocolate – that give mole its richly layered flavor. As the sauce simmers over a wood fire in the backyard, Rick and Lanie use some of it to make a succulent Laquered Chicken in Classic Red Mole and whip up some Classic Mexican White Rice with Sweet Plantains and a Mexican crudité platter. As the sun sets, family and friends gather in the garden for a taste of true Mexican soul food: homemade mole in all its slow-simmered glory. What could be better than a freshly made, gooey, warm quesadilla? Rick answers the question by showing us how to make the flour tortillas from scratch. What could be better than that?Well, actually, in Mexico, Rick explains, quesadillas and flour tortillas have nothing to do with each other. He takes us to the Bazar Sabado, a charming colonial-style labyrinth of handicrafts shops in the heart of Mexico City’s bohemian Coyoacán district, to experience the true art of the quesadilla. In the Bazar’s shady courtyard, the delicate treats are made the traditional way from freshly ground corn masa, patted onto a massive cast-iron griddle, topped with cheese and fillings and baked to a golden finish. For a more rough-and-tumble look at the same idea, we visit Lagunilla, the city’s fantastical flea-market, where vendors turn out all kinds of mouthwatering quesadillas and other toasted-masa snacks on a griddle over a charcoal fire. Then it’s on to Paxia, a stunning fine-dining restaurant, where Rick shows us one more style of quesadilla, a cheese-filled pocket of masa that’s deep-fried to make a golden turnover. At Paxia, they serve a miniature version of these as an amuse bouche. Across town at La Merced market, Rick checks out the classic cheeses for quesadilla-making, and picks up some requesón, the Mexican version of ricotta. It’s a fresh cheese and fresh cheeses are easy to prepare as Rick shows us by making Mexican Fresh Cheese in his Chicago kitchen. Then, he turns it into Luxurious Rustic Griddle-Baked Quesadillas for a romantic date-night dinner with his wife, Deann. Carnitas – chunks of pork cooked slowly in lard until they’re golden and crisp on the outside and meltingly tender inside – are a weekend family tradition in Mexico. At the Medellin Market in Mexico City, Rick gives us an insider’s look at how they’re made every Saturday and Sunday in a huge copper cauldron, and served up with fresh corn tortillas and crispychicharrón (pork cracklings). But what if a carnitas craving strikes and you’re not in Mexico on a weekend? No worries. Back in Chicago, Rick demonstrates his signature method for making fabulous carnitas right in a standard home oven. Then, thinking beyond pork, Rick shares a creative take on carnitas at the splashy seafood restaurant, Contramar, where the dish gets a deep-sea do-over with chunks of fresh-caught tuna. At his fine-dining restaurant, Topolobambo, Rick shares his own state-of-the-carnitas concept: sous vide pork (cooked very slowly in a vacuum-sealed packet), shredded, formed into a loaf, chilled, sliced and pan-seared in a stunning modern presentation. Then, in his home kitchen, he riffs on that idea, making Duck Carnitas with Crunchy Tomatillo-Avocado Salsa, a dish inspired by the classic French duck confit technique. Instead of the traditional pork cracklings, he makes ultra-easy Crispy Cheese Chicharrón, lacy cheese crisps toasted on the griddle, and takes us on a side trip to a Mexico City taquería for a look at the dramatic, giant version of these “cheese cracklings.” The elegant, yet casual, meal is served family-style with plenty of warm tortillas, so everyone can make their own succulent duck tacos. We find Rick and his daughter, Lanie, at the Mexico City’s colorful Sonora Market, an emporium of medicinal herbs and the best place in town to buy cazuelas, the beautifully rustic earthenware cooking and serving casseroles that define a whole class of stews and taco fillings. We tend to think of taquerías for their familiar grilled and griddled fillings, likecarne asada. But, Rick explains, there’s a whole world of stands and shops that have no grill at all and specialize in satisfyingly homey, slow-cooked fillings made in cazuelas with everything from stewed meat to richly flavorful vegetables. Rick and Lanie check out El Güero, a Mexico City institution, popularly known as “Tacos Hola!,” that specializes in slow-cooked taco fillings. Back home in Chicago, Rick and Lanie plan a cazuela-taco dinner. Lanie throws together a quick Pork with Smoky Tomato Sauce and Potatoes in the crockpot before heading off to school. By dinnertime, it’ll be meltingly tender and richly flavored. Meanwhile, Rick gathers some chard in the garden, offering a quick intro to the care and tending of this hearty, easy-to-grow vegetable. Then, he turns his harvest into a filling of Creamy Braised Chard, Potatoes and Poblanos and also prepares a Veracruz-Flavored Chilled Seafood. The three fillings, mounded in those charming cazuelas from the Sonora Market, form the centerpiece for a cozy dinner with friends and family. Rick’s out to dispel the notion that an enchilada is all about smothering tortillas in sauce and gooey cheese. At Café Azul y Oro in Mexico City, he shows us the iconic Mexican version of the dish: a corn tortilla in a red mole sauce and rolled around a light, simple chicken filling. From that classic formula things can, of course, get more inventive and Rick shares with us one of the more unusual, though still classically grounded enchiladas on Chef Ricardo Muñoz-Zurita’s menu: an enchilada of jamaica, or dried hibiscus flowers that tastes like a cross between pickled beets and cabbage. From there he takes us to Café Tacuba, a Mexico City Institution since 1912, where the signature Enchilada Especial is a comforting concoction with a chicken, spinach and poblano chile filling, bathed in velouté sauce and browned under the broiler. It’s so good, he can’t resist showing us how to make his one Café Tacuba-Style Creamy Chicken Enchiladas in his home kitchen in Chicago. Back in Mexico City, he brings us to another hallowed enchilada eatery, the Casa de las Enchiladas, for a lesson in the four “pillars” of enchilada construction: the tortilla, the filling, the sauce, and the garnish. Here, diners get to build their own enchilada by choosing from several options in each category. That gives Rick an idea: in the kitchen of his fine-dining restaurant, Topolobampo, he challenges his chefs to design a new enchilada special for the restaurant – each choosing a “pillar” to work on. In a fast-paced, reality-style race to the finish, the chefs create a surprising dish, proving in the process that a “whole enchilada” is greater than the sum of its parts. Chorizo, the succulent pork sausage seasoned with chiles, spices and a touch of vinegar, is the “bacon of Mexico” – the perfect accompaniment for eggs and, like bacon, a versatile ingredient for cooking that can give any dish a serious head start on flavor. At his neighborhood Mexican grocery in Chicago, Rick shows us fresh-made chorizo sold at the butcher counter and talks about how it is made. Buying a batch of the sausage to take home, he quickly turns it into a Caramelized Onion and Chorizo to use for a taco filling. Then he transforms that full-flavored mixture into a dressing for a Chorizo Spinach Saladwith jicama, a Mexican-style take on the classic wilted spinach salad with warm bacon dressing. At the Medellin Market in Mexico City, he introduces us to green chorizo, a popular 20th-century innovation from the town of Toluca, made with fresh herbs and cilantro, now enjoyed all over Mexico. In the U.S., it’s not easy to find. So, in his home kitchen, Rick shows how to make it from scratch, and then puts it to use in a classic way:Green Queso Fundido, a warm fondue-like melted cheese dip. Then it’s back to Mexico City and the high-style Paxia restaurant where we get a look at the chef’s whimsical, thoroughly modern reinterpretation of chorizo and eggs: tiny quail eggs served on dollops of light, frothy chorizo mousse. That prompts Rick to share with us his own “chorizo revisited” signature at his fine-dining restaurant, Topolobampo – Seafood Chorizo, a delicate poached seafood sausage, seared and served over a tangle of salad greens. Rick and his daughter, Lanie, check out a fabulous fish fillet at a neighborhood restaurant in Mexico City, and then, at a seafood street stall, they get rapturous over a plate of succulent garlicky prawns that rivals the best scampi in the world. The common denominator of these two dishes? It’s one of the cornerstones of Mexican cooking, Mojo de Ajo (literally, “bath of garlic”) – a sauce made by slowly simmering garlic in olive oil and seasoning it with lime and chiles. Back home in Chicago, Rick shows us how he plants, grows and cures this flavorful garlic variety, then uses some to make a big batch of Mojo de Ajo – a jar of “liquid gold” to keep on hand for enhancing just about anything. First, he uses some of it to makeMixiotes of Woodland Mushrooms with Slow-Cook Garlic and Mexican Herbs, bathed in mojo and baked in parchment. Then Lanie uses a little more to make her favorite snack, fresh-popped Garlicky Popcorn with Mexican Queso Añejo “buttered” with mojo and sprinkled with chile powder. Now it’s Rick’s turn to whip up a quick Seared Fish Fillets in Fruity, Nutty, Garlicky Mojo. And finally, Lanie helps him make a favorite family specialty:Garlicky Linguine with Seared Shrimp, Chipotle and Mexican Aged Cheese. It all adds up to this: a splash of mojo de ajo can be the Midas touch that turns just about any ingredient into culinary gold.